After last week’s cookbook announcement, I wasn’t sure what to post today. Saturday morning was spent perfecting a recipe for fruit pastilles and eating one too many scones (for quality control purposes, of course), so come lunchtime all I wanted was something really simple and savoury. 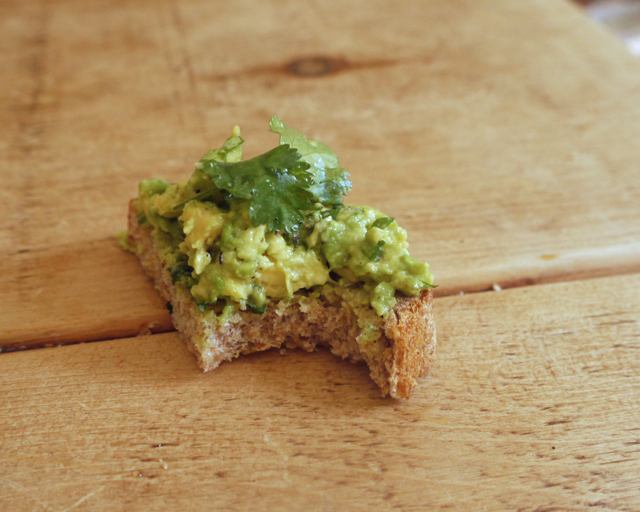 As I sat down to avocado on toast, I realised I’d never posted my version of it in on this blog. A few minutes of photos later and this post was ready to roll. Job done. Avocado on toast isn’t rocket science, but you’d be surprised by the number of dud versions I’ve had over the years made with boring bread, under-ripe avocado, too much topping or not enough seasoning. I’ve put ‘the best’ in brackets to indicate that this recipe is adaptable: everyone has their preferences – a little less chilli, a little more seasoning. Tweak as you see fit to make your ‘best’, but know that this is mine. The avocados should be rich and buttery. Good bread is essential: homemade if that’s your thing (it’s mine, more bread recipes here); bought from a good quality bakery if it’s not. Slice the bread thick, toast well and here’s the trick, rub it with the cut side of half a garlic clove, bruschetta-style, to add a little flavour (and ward off vampires). 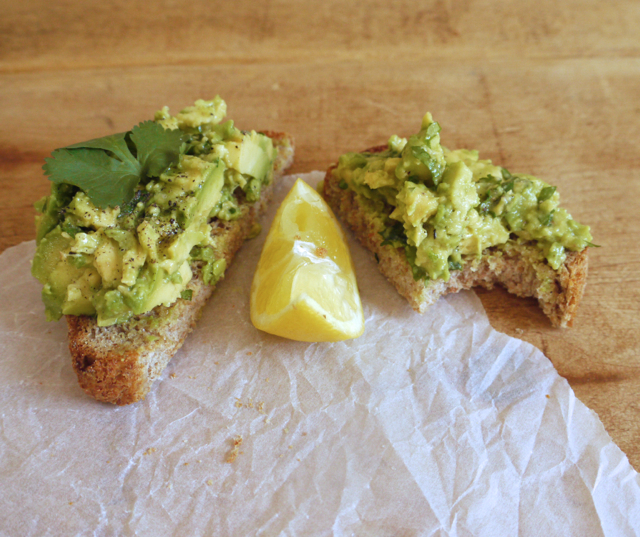 Dice your avocado into chunks – half an avocado per medium sized slice of bread should be good. Stir with a squeeze of lemon, a scrunch of salt and pepper, some finely chopped coriander and a little fresh chilli. Lime also works well; chives or parsley if you prefer. Dried chilli in a pinch, although I love the kick of fresh. 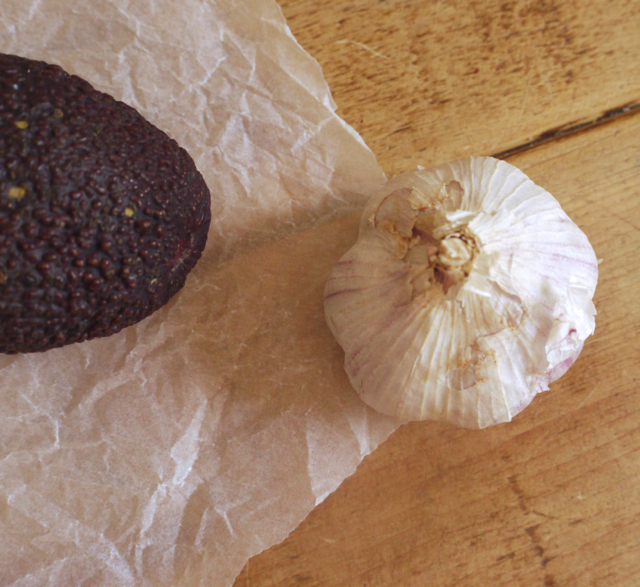 Mash the avocado gently with the back of a fork – you want some mush alongside larger chunks. 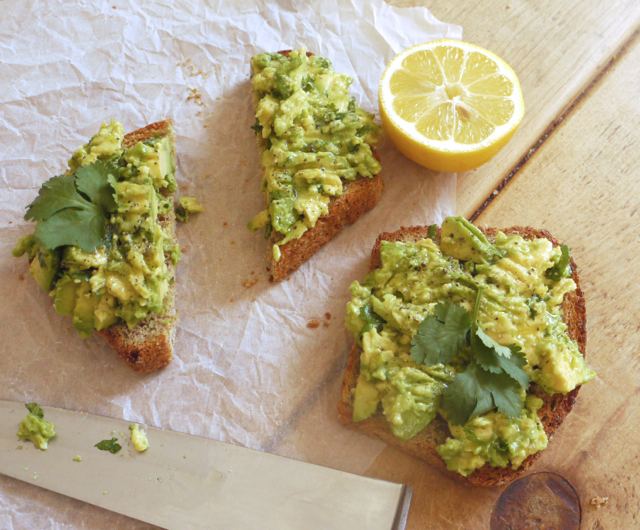 Scoop the avocado onto your toast. Add a little extra coriander, a glug of good olive oil and a squeeze more lemon if you like. A handful of rocket on top, a fried egg, roasted tomatoes or rashers of crisp bacon are also delicious. Eat immediately (unless you’re a pretentious food blogger, in which case stand on the table and take a few photos first). Finally, I just wanted to say a HUGE thank you to everyone who commented, emailed, tweeted and texted me about the book announcement. It’s a whole heap of hard work and incredibly gratifying to know that there are people out there other than me who are excited by the prospect of a little loaf book. No glass to raise today, but an (avocado) toast of sorts. Rub one side of each toast with the garlic. In a small bowl, mash the avocado with the lemon juice, salt, pepper, chill and coriander. Spread on toast. Drizzle with good olive oil and sprinkle over a pinch of flaky sea salt. Eat immediately. ps To everyone who’s emailed about recipe testing, I promise to get back to you soon! I’ve had such an incredible response, putting together my team of testers is threatening to become a full time job in itself . . .
« Some REALLY BIG Big News . . .
Looks wonderful and I know it will taste fabulous as I posted a similar version last week, but South African style with cream cheese spread on the toast too! I LOVE avocados and on toast is JUST the best way to eat them! This has got to be one of my favourite things to eat and works well for breakfast, brunch and lunch, or just a snack to keep you going in the afternoon. It’s always yummy with a poached egg and crispy bacon too as you say. I think it was the Breakfast Club that got me addicted to it! I love avocado on toast. If you are a Marmite lover, I recommend a little Marmite on the toast rather than the garlic – I think it is a surprisingly good combination! Gonna give this a try…always wanted to try something different with avocados. An excellent way to celebrate! 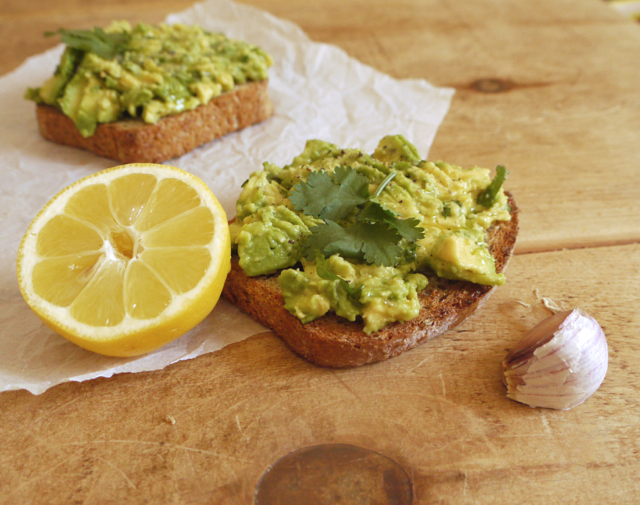 Avocado on toast really is the king of lunch snacks! Your version looks delicious. Also, belated congratulations on the book. It is so AMAZING and you must be so excited! Well done! 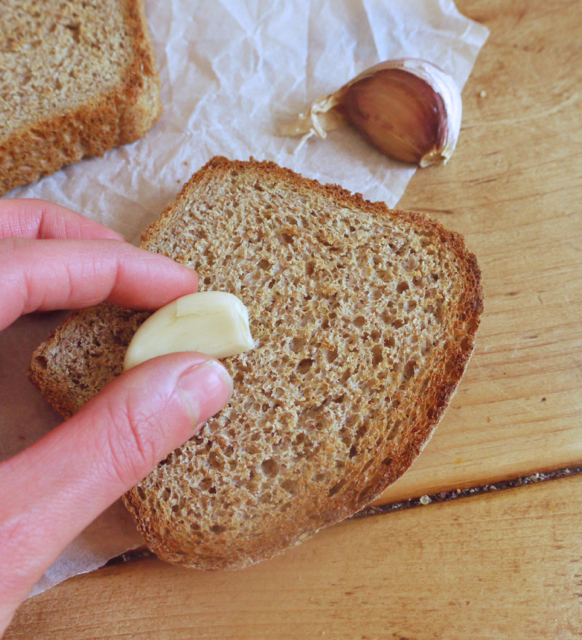 Fabulous tip to rub the garlic on the bread. I find that no matter how little raw garlic you put in something (pesto etc.) it feels like a bit too much … or at least for my husband it is! The Spaniards do this for their ‘pan con tomate’, rubbing the cut side of a tomato over the bread as well. So simple and yet works so well! Oh this looks yummy–and I know avocado and a runny egg is a terrific combination so I know this tastes delish. Thanks for the garlic tip–I’ll try that with fresh once they are harvested, but for now I can smash a clove of roasted garlic from the freezer stash and ‘butter’ the bread that way.